Imagine you write to someone who has just gone on their annual leave. Not a big deal, everyone needs a vacation once in a while. But what if they forget to set up their Out of Office reply or take a sudden leave and your email is not forwarded? Personally, I would be pretty furious if I had to wait for a week just to find out someone was absent. Another problem with Out of Office replies is that sometimes they are unique, user-created. Sometimes, those automatic responses might be even worse. Most people just want to know when you come back and who to contact when you are gone. They are not that interested in your family life, or what you like to do in your free time. Some Out of Office messages make you think what kind of company is into such oversharing policy. Unfortunately, such situations happen. Neither Exchange Server, nor Office 365 lets you centrally manage those automatic replies for other users in a user-friendly way. That is why we have thought that a free Out of Office Manager might come in handy. CodeTwo is all about solutions. We have developed a tool which lets you take full control over automatic responses in Exchange and Office 365 organizations. CodeTwo Out of Office Manager lets you create automatic responses which will be sent without any actions from your users. The tool lets employees channel their creative potential towards work, while the automatic responses are taken care of. Professional and branded, as they should be. Oh, and here comes the best part, CodeTwo Out of Office Manager is now free. 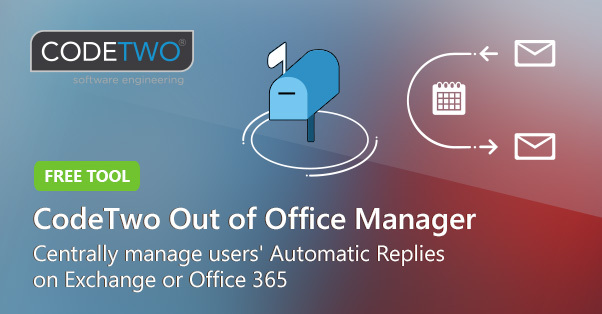 CodeTwo Out of Office Manager lets you create automatic responses for all users at once. 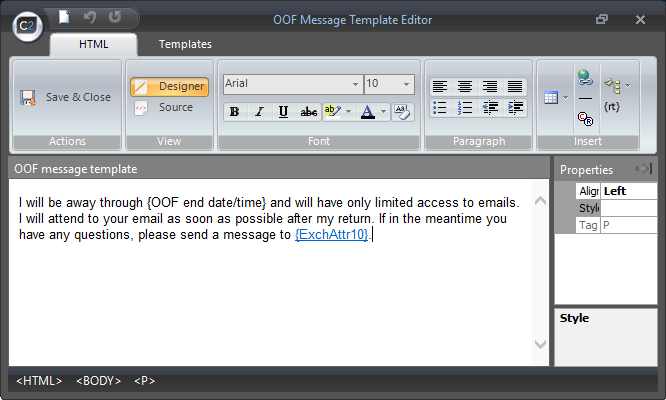 Those out of office messages will be personalized and applied automatically according to the schedule. Simply speaking – you design an out of office message template and use a simple calendar to mark when employees are absent. The program can automatically add the right return date and user-specific details to messages and send them whenever necessary. The freeware could also be very useful to your HR and department and managers. For them, CodeTwo Out of Office Manager will make employee time tracking almost effortless. The simple calendar view and filtering options make it easy to keep track of absences with an added value of certainty that their customers and colleagues will always know when the user returns and who might help instead. Another thing is that standard out of office messages are sent only once per sender. That may cause a big problem if the user is out of office for a longer period – senders might forget that they have received a notice before and will wait for an answer, which might take a long time. CodeTwo Out of Office Manager lets you change this default behavior. You can change the settings so that each sender receives multiple automatic responses from the unavailable employee, for example, if the contact attempt is repeated after a few hours. It is exceptionally useful if an employee unexpectedly prolongs their out-of-office time. There are more features you can benefit from! For the full list of functionalities, visit CodeTwo Out of Office Manager official page. You can also download the freeware and check how it works for yourself.